Market’s top performers include the most-hated stocks! 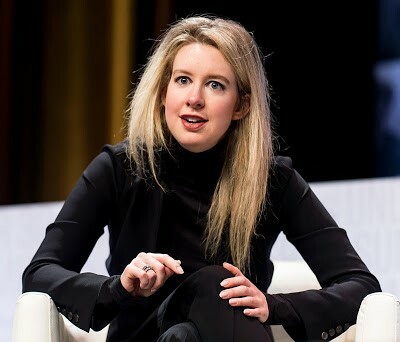 A criminal case against Elizabeth Holmes — overkill? It’s been a lousy spring for short sellers — the people who make their money betting the prices of certain stocks will go down. 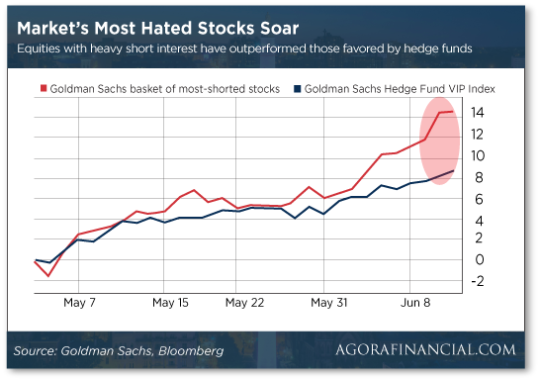 Last week, Goldman Sachs crunched a few numbers and found that a basket of 50 heavily shorted companies jumped 16% since May 1. “That’s twice the return of a separate collection of companies favored by hedge fund longs,” says a Bloomberg News story. In a way, that’s to be expected. After all, the S&P 500 jumped about 5% during that span. Stocks in general have been rising. But for these most-hated stocks to rise that much? “This rally is evidence, in our view, that investors increasingly see the potential for fundamentally distressed companies to recover in a strong U.S. growth environment even as global concerns that have held weighed on the broader equity market,” say Goldman’s analysts. What accounts for the anomaly? One of the major factors the analysts cite is economic numbers that are better than expected. Low unemployment, inflation still (mostly) tame, more consumer spending, even more business investment here and there. And that trend is set to continue judging by the “GDPNow” figure from the Federal Reserve Bank of Atlanta. Basically, the Atlanta Fed takes scads of economic indicators and uses them to project what quarterly GDP growth will be. Right now, the model projects annualized growth during the current quarter of 4.8%. If that number holds — admittedly, there’s no guarantee — we’re looking at the strongest economic growth since the first quarter of 1999. Or at the very least, the strongest performance by far coming out of the Panic of 2008. For our purposes today, that means these most-hated stocks are set to continue rallying. A select handful are in line to make vertical moves — literally moving straight up on a chart. A classic instance we cited was BP, two months after the 2010 explosion of its Deepwater Horizon offshore oil rig. In a six-week span, BP shares zoomed up 52%. “The drop was too far, too fast,” said Alan. That’s the very moment to swoop in — even if all your emotions and even your “logic” are telling you otherwise. “The negativity around this stock wasn’t bound to last,” Alan says. Trades like these can deliver payouts of $6,754 or more in the space of a week. If you’re still not convinced, Alan has some even more powerful examples at this link. As with last week, the markets at the start of this week are highlighted by small-cap outperformance. By day’s end Friday, the Dow had recovered a good chunk of its early-day losses. But the selling has resumed this morning and at last check the Big Board is back below 25,000. But the small-cap Russell 2000 is slightly in the green and angling for another record close. All else being equal, small caps are less affected by trade wars and a rising dollar — both of which have been at play all spring. Gold remains down and out after Friday’s whacking, the bid stuck at $1,278. Crude, however, has poked its nose back above the $65 level. Just one economic number today — the Housing Market Index from the National Association of Home Builders. On the one hand, sentiment revealed by the survey is still gangbusters. On the other hand, the June number is the weakest going back to last September. For whatever reason, homebuilders are inclined to pull in their horns a bit… which doesn’t bode well for an upswell of new construction to meet demand, does it? For as much as we’ve mocked Elizabeth Holmes, a criminal indictment seems excessive. And, frankly, a distraction from the real fraud. The sorry tale of Holmes’ firm Theranos is approaching its end stage: After we went to virtual press on Friday, the feds charged Holmes and her right-hand man Ramesh Balwani with nine counts of wire fraud and two counts of conspiracy. Maximum penalty — 20 years in Club Fed, a fine of $250,000, plus restitution. Maybe the feds have a smoking gun — you know, Holmes and Balwani trading emails saying, “I can’t believe these patsies fell for it!” But as we said more than 18 months ago, it’s more likely Holmes was merely following the curriculum taught at America’ most prestigious business schools: Express total confidence on the outside even if you’re harboring doubts on the inside. A criminal indictment seems over the top — just as the slap-on-the-wrist civil case went to the other end of the spectrum. As we mentioned earlier in the spring, the SEC fined Holmes a paltry $500,000 — literally 0.071% of the $700 million she raised from investors. Meanwhile, the real fraudsters of Theranos will almost surely get off scot-free. You just know there were some investment bankers who had a hand in convincing those investors to pour $700 million into Holmes’ company. They might have suspected Holmes was overselling her story… but they didn’t want to investigate too closely as long as they were collecting hefty fees from people falling all over themselves to dump money into Theranos. That’s how it always works. Certainly that’s how it worked two decades ago during the dot-com bubble. The investment banks “were effectively pimps pushing lemon companies as hot IPOs in order to make themselves and their bosses rich while internally calling the companies dogs and crap in emails,” recall Pam Martens and Russ Martens at Wall Street on Parade. We still have an enormous backlog of thoughtful emails from readers on the topic of when they took, or plan to take, Social Security. “I’m 74,” says one. “I’ve been self-employed for 45 years and done a lot of things, mostly to do with construction and specialized woodworking, with some sidelines in adolescent intervention. “I decided to take benefits at 63, to give me a little more flexibility, rather like a credit line. Because my philosophy about taxes has been steadfast, i.e., delay wherever possible by investing in business, etc., plus a number of years of zero income while traveling and living abroad as a young man, my SS is a bit less than $1,000 a month, which is enough in the part of rural Pennsylvania I live in to bolster my diminished income without having to hustle cabinet work. The 5: Spousal benefits are available… but as we documented in 2015, there are academics who get columns published at MarketWatch proposing to do away with them. It seems like an outlandish idea right now… but we also thought the feds would keep “file and suspend” available at least three years longer than they did. “Interesting question,” says another. “I am 51 years old now and when I was younger, I assumed I’d wait as late as possible to increase the monthly benefit amount. “However, I became convinced that Social Security would be gone or severely diminished by the time I reached retirement age so my husband and I bought rental properties and set up some other passive income streams, left our expensive life in California and moved to Panama. “We’ve since converted half of our IRAs to Self-Directed IRAs and put that money into agricultural investments outside of the U.S. (think avocados, coffee, etc.) so that by the time I’m 59.5 years old, we can start collecting that income as well. We’ve set up our financial lives assuming Social Security will be a distant memory by the time we retire. “So if there is actually money left in the Social Security trust fund by the time I reach the age where I can start to take it, seems like that’s the logical thing to do. The 5: It’s true, and we never want to take that for granted! You need all three. But once they’re there, you’re in line to collect gains of four and even five figures in a matter of weeks — sometimes days. And they’re the key to every recommendation in our newest premium service, Alan Knuckman’s Vertical Fortunes. The charter subscriber rate is still available through midnight tomorrow night. After that, it’s off the table. Click here to grab our best deal.